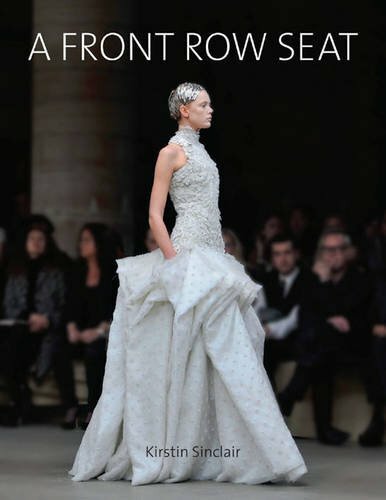 A Front Row Seat could actually be called The Anatomy of a Fashion Show or Catwalk. Ms. Sinclair takes us to every part of the fashion show catwalk phenomenon: from what you see before you walk in, to the pecking order of the front row, to the backstage machinations, to the models themselves, and to the buyers—without whom there would be no reason for a catwalk. This is the pictorial story of what happens twice a year in the fashion capitols of the world: Paris, Milan, London, and New York City. Ms. Sinclair offers commentary to go along with the photographs in this beautiful album, including some insights that are not the usual fare of fashion tomes. These marked differences are what set this book apart from its “colleagues.” Kirstin Sinclair takes her story the extra mile to show off the audience and the show and to include the entire cast of characters in the stage play that is the fashion show. But in A Front Row Seat we get the entire scoop from nuts to bolts as well as photos featuring everyone in the know, from real celebrities to model celebrities to fans who achieved their own brand of celebrity by dressing up and attending shows all over the world. In this hyper-communicative world, Ms. Sinclair goes beyond the usual People magazine fare and includes photographs showcasing many types of fame and notoriety—to get our attention, for sure; but she never loses sight of that fact that this is all part of a fascinating business to both those in the know and those who would like to be.